Dallas Movie Screenings: Cook Off! Cook Off! has the stench upon it of falling into the unfortunate trap of being improvised to death. Nothing about the screenplay (by Wendi McLendon-Covey, W. Bruce Cameron, and co-director Cathryn Michon and based on Michon’s book The Grrl Genius Guide to Life) feels as if it was written down or typed onto a document by human hands. The actors, a lot of whom are genuinely talented, simply mug for the camera for 98 minutes. Not one of the characters is sympathetic. 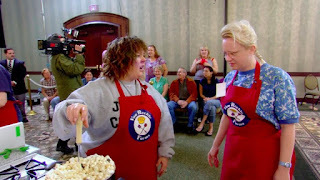 The story is told in the mockumentary style of cooking-themed reality programs like “Chopped” or “Top Chef.” The behind-closed-doors baggage of a movie rarely matters, but let us say that it is not surprising that the film, shot in 2006 for a planned 2007 release, has been shelved for a decade. The year is 2004, and the setting is the disproportionately popular “Million-Dollar Cook-Off” spearheaded by the Van Rookles, whose current patriarch (played by Stephen Root) merely video-conferences a message to the contestants before they begin cooking. The contestants must prepare a dessert of some sort, and what each one prepares apparently isn’t important to the movie. One dessert requires an endless supply of bite-size marshmallows, another one is a pie whose chef burns it at some point, and a third requires creamed corn. That’s about all one will be able to remember, because this is a movie whose priority is to give us a collection of wacky characters and let them loose to do their thing. We get rival sisters in the form of the Solfests, Sharon (Michon) and Pauline (McLendon-Covey). The latter is a meek nurse whose only life until now has been caring for the elderly 14 hours a day, coming home, and going to bed, and McLendon-Covey’s chosen method of playing the part is to scowl at everything. The former is engaged to Lars (Gary Anthony Williams), and though the pair remains chaste, the way Williams plays the man makes his homosexuality so obvious that it’s a joke when it isn’t the punch line to a larger joke: that Sharon is engaged to a gay man. It’s because this is that kind of movie: Through the power of unbridled improvisation, the film sets up gags and, perhaps because of the combination of the style and a narrative that won’t allow for it, cannot follow through on them. Patty (Romy Rosemont) is an overworked, very pregnant mother and wife whose marriage is dangling by a thread. Victoria (Cristine Rose) and Cassandra (Jennifer Elise Cox, giving the only performance that suggests effort) are a mother/daughter pair, the former exercising an insane, abusive amount of control over the latter. Daneel (June Edith Wilson) is a former contestant obsessed with winning who enlists Del (Diedrich Bader), the only male contestant in history, to cook her recipe for some sort of chocolate-covered thing. Ladybug Briggs (Niecy Nash), the lone black contestant, is a wise-cracking-Baptist stereotype. There are others, too – such as Melissa McCarthy, prominently framed in the marketing but only present for 15 minutes as a latecomer whose sole characteristic is being constantly tearful and harried – but they are barely worth mentioning. Michon and co-director Guy Shalem certainly mimic the look and energy of a cooking program, but the result also means the film looks cheap and quickly, thoughtlessly produced. Even at a mere ninety minutes, sans the ridiculously extended closing credits (filled, of course, with bloopers), Cook Off! is padded quite beyond the point of return.